Will Ryman’s Roses being installed on Miami Beach. Image via The Art Newspaper. Art Observed is on site for this year’s 10th edition of Art Basel Miami Beach which officially runs December 1–4, with previews and parties throughout the entire week beginning on Tuesday, November 29th. More than 260 galleries from around the world will be representing over 2,000 artists, not including the several satellite shows taking place simultaneously across Miami, including NADA, SCOPE, Pulse, and the original Art Miami—twelve years Basel’s senior. Attracting 46,000 visitors in 2010, the fair is expanding every year, with various collaborations and special additions celebrating its 10th. The Swiss-based Basel art fair installment in Miami has evolved into something that may have lost some of its innocence from its earlier days but in the end has become the definitive closing party for the art market’s year. There have been many previews and summaries of the fair, the following is our view of the week to come. 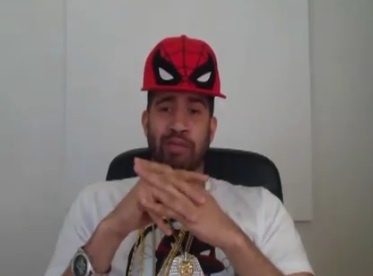 Hennessy Youngman, still from ART THOUGHTZ: Relational Aesthetics. Via Youtube. Youngman will be speaking at NADA Deauville Beach Resort on Thursday at 5 pm. Christopher Janney, Harmonic Convergence, at Miami International Airport. Image via Piccsy. 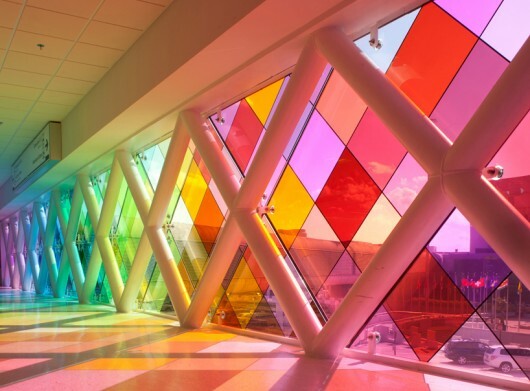 The art-infused week begins right in the airport, where visitors pass through Christopher Janney’s 72-foot colored-glass window, complete with underwater scuba sounds. An hour bus ride from Miami International awaits The Miami Beach Convention Center, home to the main fair. Wednesday evening begins the week properly with an invite-only vernissage, opening to the public Thursday through Sunday from noon to 8pm, closing at 6pm Sunday evening. Rob Pruitt, Baby (2011). Via Gavin Brown’s Enterprise (Booth L18). The prospects for sales at this year’s fair remain difficult to predict. The recently acute destabilization of the Eurozone sovereign debt markets and its associated economic contagion cast a pallor on the New York auctions of late, while in contrast, some records were established at the rostrum and the mitigating presence of new groups of collectors from overseas such as those from China was certainly a factor. Additionally, many Latin American economies such as Brazil are surging and this fair has always been the gateway to buyers from South and Central America. 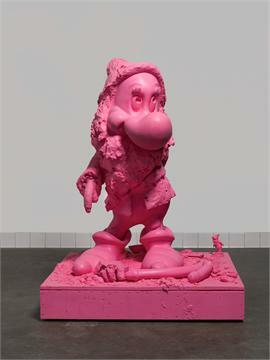 Paul McCarthy, White Snow Dwarf (Bashful) (2010). Via Hauser & Wirth (Booth L17). 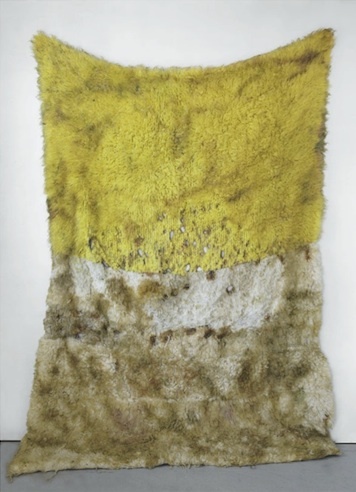 Anna Betbeze, Mimosa (2011). 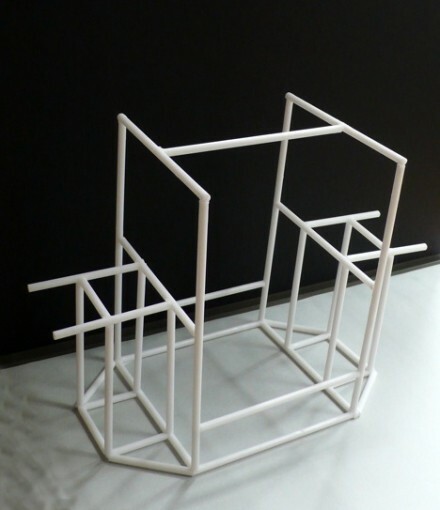 Image via OHWOW; showing at ‘That Ain’t Fair.’ Betbeze will also be showing at Kate Werble at NADA. Miru Kim, The Pig That Therefore I Am. Image via DesignBoom. Kim will be at Primary Projects, 4141 NE Second Avenue Suite 104, Miami Design District. In one of the more hyped works of the fair, Miru Kim plans to spend the week living with pigs in her piece The Pig That Therefore I Am. While also showing at Lehmann Maupin, Erwin Wurm‘s Drinking Sculptures will invite visitors to sit down for a drink at the nearby Bass Museum of Art as part of his solo exhibition Beauty Business. 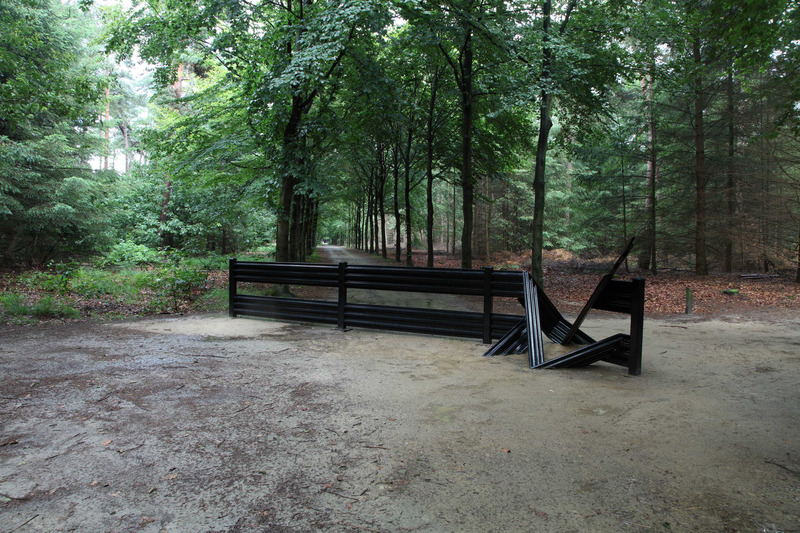 Erwin Wurm, Drinking Sculptures (2011). Via ArtInfo, at Lehmann Maupin (Booth K15). Gabriel Orozco, speaking Thursday morning. Photo by Art Observed. Tracey Emin, speaking and showing various works throughout the fair. Photo by Art Observed. Aside from the overwhelming rows of booths and/or installations, throughout the week various ‘Art Basel Conversations’ include artists such as Gabriel Orozco and Tracey Emin as well as numerous art world luminaries, directors, and curators. Marina Abramović’s new documentary about her MoMA retrospective The Artist Is Present will be premier Wednesday night at the Soho Beach House. Marina Abramović premiers a new documentary Wednesday night at the Soho Beach House. 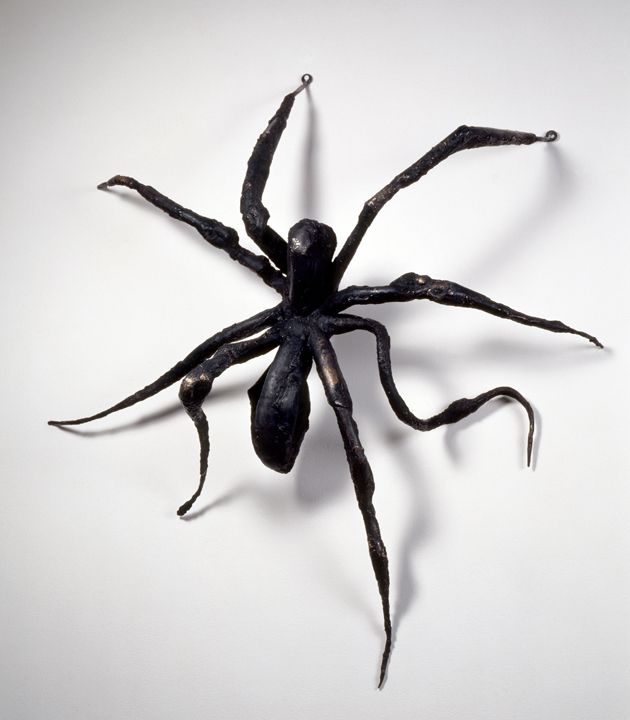 Image via MoMA. 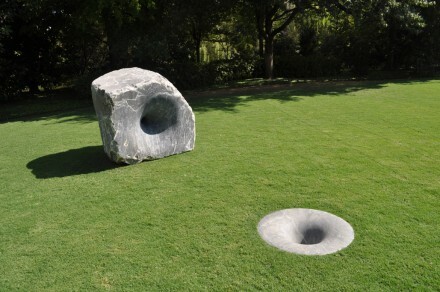 Anish Kapoor, Black Stones, Human Bones (1993). Image via Art Basel, showing in Collins Park. Damien Hirst, Sensation (2011). Postcard image via Ebay, sculpture showing at Collins Park. Nearby Collins Park will display 24 outdoor sculptures, a collaborative effort by Art Basel and the Bass Museum of Art, featuring works by Damien Hirst, Anish Kapoor among others. Of note, Los Angeles artist Glenn Kaino plans to raise a 20 x 20 foot sculptural platform for the length of the fair via volunteer effort; the appropriately titled performance piece Levitating the Fair is one of many performances to take place in the park. New World Center designed by Frank Gehry. Image via DesignBoom. Gardar Eide Einarsson, Untitled (Apparatus) (2011). Image via Team Gallery (Booth G8). Outside the main fair are the many satellites, with a free shuttlebus to NADA, located further north up Miami Beach, with most other satellites in downtown Miami or the Design District. Hennessy Youngman presents ‘His History of Art,’ a semi-farcical take on the history of art and its relevance to human life, beginning with the cavemen. Anselm Reyle collaborates with Dior for a pop up shop. Image via Dior. The Raleigh Pool. Image via The Raleigh. Important hotels for the evening cocktail scene include Delano, Mondrian, The Raleigh, Soho Beach House, Shelborne, The Standard, and W, with their corresponding parties and events listed below. Vanity Fair Party and Vanity Fair International: 7 pm, 770 NE 125th Street. Ingrid Sischy and Sandra Brant of Vanity Fair International are honored along with 15 years of MOCA and 10 years of Art Basel. Invite only. Interview Magazine Party: 8:30 pm, 1111 Lincoln Road. Peter Brant and Tobias Meyer host a party for Ferrari chairman Luca di Montezemolo. The new Ferrari 458 Spider and a new video installation by Marco Brambilla will be unveiled. Invite only. Le Baron at Delano: 11 pm – 6 am, Tuesday through Sunday, 1685 Collins Ave. Graffiti artist André Saraiva’s notorious and international pop-up club returns to the Florida room in the Delano, though originally held in the basement of the Shelborne. Mr. Saraiva’s clubs include current outposts in Paris, Tokyo, recently LA and London, with a soon-to-open spot in China Town, New York City (Saraiva is currently throws parties at Le Bain atop The Standard in New York). Invite only. Rubell Breakfast: 9 am – noon, open Wednesday through Sunday, at the Rubell Collection 95 NW 29th Street. Jennifer Rubell’s 11th annual food as art installation this year features Incubation which draws parables between creation and consumption through yogurt and honey. Erwin Wurm opening at Bass Museum of Art: 8 – 11 pm, 2100 Collins Avenue. DJ Kolkoz performs while onlookers take in Mr. Wurm’s new body of work centered on houses and dwellings. Invite only. Mr. Brainwash’s solo show Untitled: 8 – 12 pm, 2000 Collins Avenue. Mr. Brainwash takes over the same building as last year, and fills it with his artwork. Jeffrey Deitch and the MOCA at the Raleigh Hotel: 9 pm – late, 1775 Collins Avenue. A beach party thrown in the famous Art Deco pool replete with DJs. Invite only. Paris Paris: A karaoke dive bar-esque alternative Le Baron will run from 10 pm – 6 am at the Shelborne hotel through the week, the original site of André Saraiva’s Le Baron Miami edition, Le Baron will be in residence at the Florida Room at the Delano through the week. Art.sy party at Soho Beach House: 10 pm, 4385 Collins Avenue. A new online publication backed by Dasha Zhukova and Gagosian. Invite only. Louis Bourgeois, Spider I (1995). 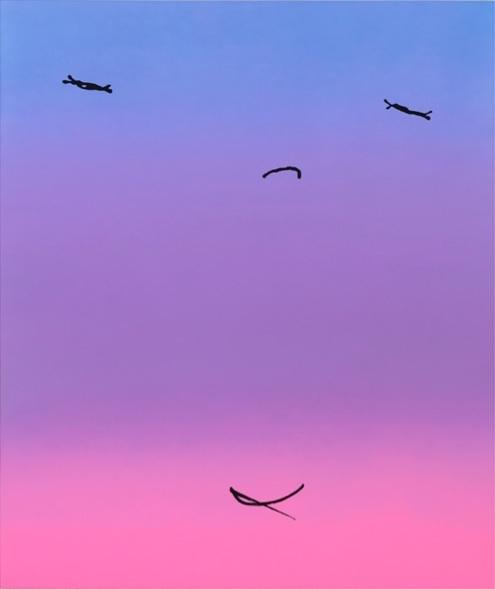 Image via Robert Miller Gallery (Booth B18). Sender Collection private viewing: 9 am – noon. Adam and Lenore Sender install over 70 contemporary works in a private and empty North Miami residence. Invite only. Canyon Ranch Miami Beach breakfast: 6801 Collins Avenue. Collectors from galleries Eleven Rivington, On Stellar Rays and Renwick Gallery will be there. Invite only. Saturdays Surf NYC Pool Party: 1 – 5 pm, Mondrian Hotel. New York City coffee and surf shop throws a pool party on Thursday and Saturday, same time. 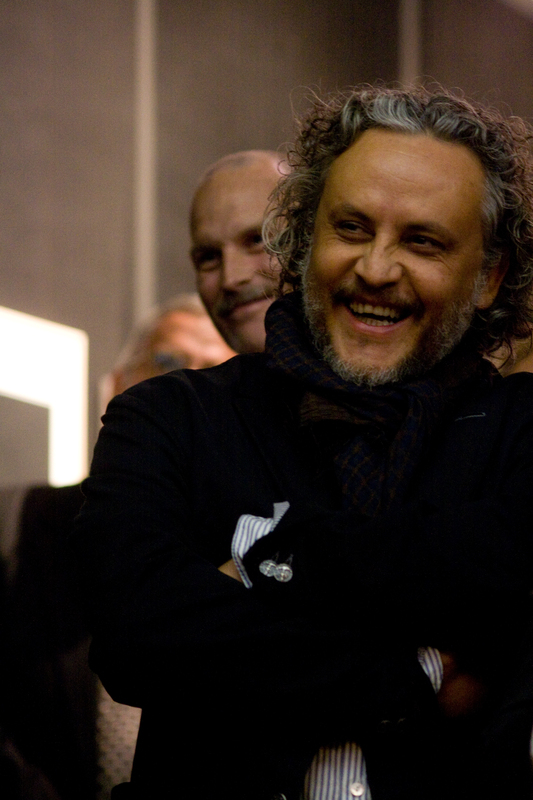 Art Conversations Premiere Gabriel Orozco and Michelle Kuo: 10:00 – 11:30 am, The Main Fair. A forum discussion focused on the collecting of art. Hennessey Youngman at NADA Deauville Beach Resort: 5:00 pm, Collins and 67th St. YIBA (Young Internet Based Artist) gives a talk on the meaning of art. 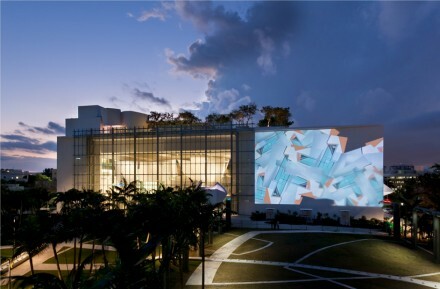 Miami Art Museum Party on the Plaza: 7:00 – 10:00 pm, 101 West Flagler Street. Performance by Rashaad Newsome, Hair Affair & FIVE. Invite only. IAMSOUND Mondrian Sessions presents Harmony Korine’s Caput featuring James Franco in collaboration with MOCA: 9:00 pm – 2:00 am, Mondrian Sunset Lounge. Andy Warhol San Diego Surf at the Standard Spa: 9:30 pm, 40 Island Venture. Never-before-seen San Diego Surf will be shown at this invite only event. Neckface Premier at Gusman Center for the Performing Arts with performance by the band Salem: 10:30 pm, 174 E. Flagler St. The premiere of “Born Under A Bad Sign” will be shown. Champagne and private dinner with Aby Rosen and Samantha Boardman at the Wall: 11:00 pm, W South Beach, 2201 Collins Avenue. Celebrating Dom Pérignon’s new Luminous Label. 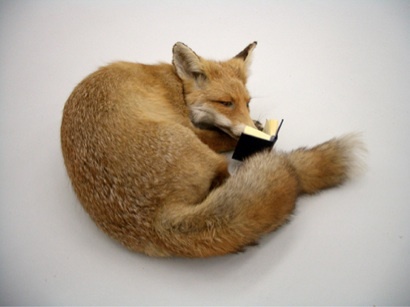 Javier Téllez, F for Fable (2011). Via Arratia Beer (Booth N36). Gerhard Richter at Colony Theatre: 8:30 pm, 1040 Lincoln Road. The United States premiere of the film ‘Gerhard Richter Painting’ by Corinna Belz will be shown. Pringle of Scotland collaboration at Mosaic Building: 8:30, 161 NE 40th Street. Cocktails and celebrities will gather for the debut of Gillick’s Pringle of Scotland collaboration. Invite only. NADA party at Shore Club Hotel: 9 pm – 1 am, 1901 Collins Avenue. Visionaire Magazine’s Art Basel Rio Party: 10 pm – 2 am, 1685 Collins Ave. Pool party at the Delano Water Salon. 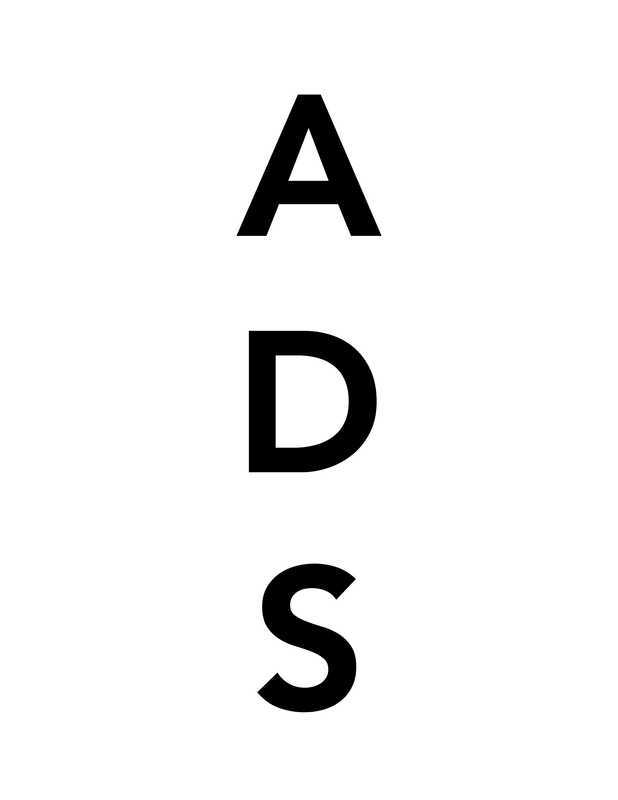 Art Digest Oasis at The Raleigh: 4 – 6 pm, 1775 Collins Avenue. A cocktail launch party for Macallan®, celebrating their collaboration with world-renowned X-ray photographer Nick Veasey, featuring DJ Mike Nouveau. Banks Violette, Not yet titled (2011). Image via Art Basel, showing in Collins Park. MAM Ball: 7 – 11 pm, 4441 Collins Avenue. The Miami Art Museum’s largest fundraister; a black-tie ball showing Dara Friedman’s latest video work, Dancer. MAM Ball after party: 11 pm – 2 am, 4441 Collins Avenue. Following the ball, iPad DJs AndrewAndrew will bring the dance party outside. MoMA PS1 Sunset Cocktail Party: 8 – 11 pm, 1100 West Avenue. Honors Ryan Trecartin and Lizzie Fitch with a special performance organized by DIS Magazine with DJs Telfar, Total Freedom, and Physical Therapy, at the Mondrian pool. 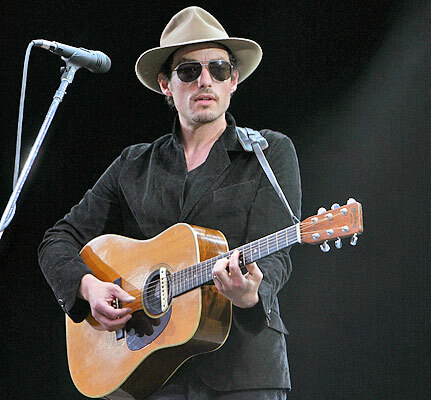 Jakob Dylan, performing Saturday night at the Raleigh. Image via Virgin Media. A Celebration of Karma: 8 – 11 pm, 1775 Collins Avenue. Cocktail party & concert hosted by Fisker Automotive CEO & Chief Designer Henrik Fisker, featuring a Special Performance by Jakob Dylan at the Raleigh. Second Annual MOCA Spin Galactic Party: 9 pm – midnight, 40 Island Venture. Poolside ping pong tournament hosted by Susan Sarandon. André Saraiva BBQ at The Standard Spa: 2 – 6 pm, 40 Island Avenue. The last big party of Miami Basel. Invite only. Veuve Clicquot Clicq’Up Café and Champagne Bar. Salem, playing at Delano on Wednesday and for the Neckface movie premier Thursday night. YACHT, playing Thursday night at the Electric Pickle. Image via The Block Magic. This entry was posted on Monday, November 28th, 2011 at 10:06 pm	and is filed under Art News. You can follow any responses to this entry through the RSS 2.0 feed. You can leave a response, or trackback from your own site.